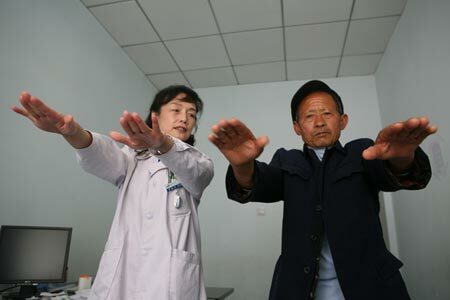 The diagnosis and management of Parkinsons disease in China is often sub-optimal and not done in accordance with best practice guidelines, Shanghai researchers say. Writing in the journal BMC Neurology, they say there are at least two million patients with Parkinson’s disease in China, accounting for two-fifths of all Parkinson's patients in the world. In a study of how the disease is diagnosed and treated, they found that the lack of movement disorder specialists and clinics in China meant that the condition was often treated by general physicians or neurologists with limited expertise in Parkinsons disease. The findings come from a survey of Parkinson's disease diagnostic methods and management carried out by Dr Chen Wei and colleagues from the Department of Neurology & Institute of Neurology, Ruijin Hospital, Shanghai Jiao Tong University School of Medicine. Their survey showed that most doctors involved in treating patient with Parkinsons disease were aware of the Chinese Parkinson's disease guidelines; however CME activity in the area was very low and few of the doctors surveyed had published Parkinson's disease-related articles. With respect to diagnostic methods for Parkinson's disease, the standard oral levodopa test and conventional MRI were commonly considered for suspected patients in routine practice, whereas other recommended diagnostic tests such as susceptibility weighed imaging, transcranial sonography and functional neuroimaging were less used. The researchers say that in China, relative expensive functional neuroimaging methods, such as PET scans are not covered by Chinese medical insurances, and few patients would like to choose them. Additionally, because of lack of knowledge and shortage of transcranial sonography experts in many hospitals, transcranial sonography is rarely accepted as a regular method. There was a relatively high level of knowledge on therapeutic strategies for Parkinson's disease among movement disorders specialists and those from tertiary hospitals. However, a discrepancy between best practice guidelines and clinical practice still exists in management of non-motor symptoms among all of the clinicians surveyed. Up to 46% of doctors selected olanzapine to treat Parkinsons patients with psychosis, only 23% of those prescribed clozapine. For treating Parkinsons with dementia, the most often prescribed treatment was donepezil, not rivastigmine, as recommended in guidelines. "Based on these observations, great efforts should be made on CME programs for physicians and general neurologists," the study authors conclude.